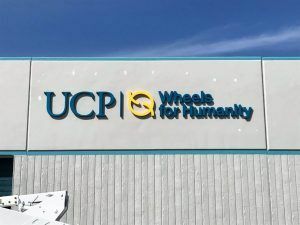 UCP Wheels for Humanity is a non-profit organization that delivers mobility solutions to people with disabilities in developing countries. They have a new location that is just down the street from us and they asked us to help them out with their new building sign. They wanted very thick letters but they weren’t looking for channel letters. Channel letters are mostly if not completely made of aluminum. The two main reasons we make channel letters is for the dimension and for illumination. The channel letters we make are either 3 1/2″ or 5″ thick depending on whether they are reverse or front-lit channel letters. We can also either make the faces translucent or the back clear depending on whether you want reverse or front-lit channel letters. 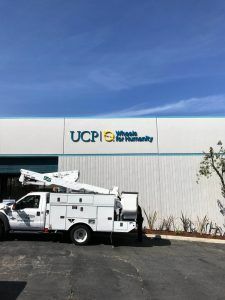 Since UCP Wheels for Humanity didn’t care to have the sign illuminated and they wanted to make sure that all of their logo colors were included, we made them foam dimensional letters. Since they wanted non-illuminated but thick letters, this was a great solution. 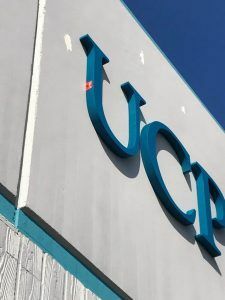 With aluminum or acrylic we usually only go up to 1/2″ thick, but foam is lightweight and inexpensive so it was a good fit for what they were looking for. Foam comes in many different densities so you want to go with a higher density foam for outdoor signs. The faces were laminated with aluminum and the whole sign was painted to match their logo colors. Although foam doesn’t come in a variety of colors, we can always paint it to customize your dimensional letters. The previous owners of the building had a sign up so before we came to install, the old sign was removed and the building was repainted. We installed the new sign where the old sign used to be, right near the doorway and it looks great with the new paint job. While designing their building sign, they started to think about other forms of signage that they could add to their new building. Like a lot of companies do, they asked us to create a lobby sign in the same style as the building sign, just made for interior purposes. We’ll be going over their dimensional letter lobby sign in next week’s blog. We have made many dimensional letter signs for buildings. Feel free to check out our website galleries to get some ideas for your building sign. If you’re ready to get a new sign made for your business, you can request a quote here.